Charlie Brooker: The New Jigsaw! This week I endured what is allegedly the final installment of the 'Saw' franchise ('Saw 3D: The Final Chapter'). I say allegedly because it still made over $45 million off a $17 million budget and producers just can't help themselves with figures like that. But it's called 'the final chapter' you might ask? Well so was 'Friday the 13th Part 4' and that was followed a year later by 'Friday the 13th: a New Beginning'. Horror monsters never die. Even if the film's called 'Freddy's Dead: The Final Nightmare', the inevitable sequel will still be rolled out a few years later called something along the lines of 'Wes Craven's New Nightmare'! So even though the 'Saw' franchises uber-psycho Jigsaw has been dead since about the third film (excuse my vagueness, the film's have tended to confuse and numb my brain more and more with each installment), that hasn't stopped the sick and twisted scriptwriters churning out more fresh meat for the grinder year on year. Jigsaw's legacy has been continued since his death by a (considerably less interesting) psychotic detective character but I write here today to argue for the legacy to be passed on! If the Saw franchise is to survive and beat a horrible box office death, it needs to move forward with a new psycho killer. Competition with the inevitable Paranormal Activity sequels is going to be fierce and I think there's only one man to tackle the job. Coincidentally, the week I watch Saw 3D is the same week I begin reading 'Charlie Brooker's Screen Burn'. His attacking of television and particularly 'reality' TV with a venomous wit and sense of outrage, reminded me of Saw 3D's new victim and his manipulation of the media and his eventual downfall. This anger and sense of superiority to the makers of crappy TV shows makes Mr Brooker the perfect man to take up Jigsaw's role as the judge and torturer of a new breed of victims. I'm only 30 pages into the book but already I've discovered enough Brooker/Jigsaw type traps to fuel the next Saw film. Brooker talks of replacing a TV host with 'a naked amputee who sits on a barbed-wire toilet seat repeatedly threatening to murder members of the audience... while toying with a bloodied switchblade'. Now there's an opening to the new film right there! What about a victim who has to 'bash his own brains out with a pewter kettle', or jump head first onto helicoptor blades so 'the top of his head was lopped off and his brain got sliced into a tumbling flock of slippery grey mind-steaks'. How about 'a protracted final sequence in which each participant is glued to a deckchair and kicked down a stairwell. Forty-seven million times.' (This is actually vaguely similar to what happens to Linkin Park's Chester Bennington in Saw 3D). Brooker's writing is full of such ideas for vicious audience-pleasuring torture. He even suggests the people who deserve punishment; 'whoever told him that this was a good idea deserves to be sealed inside a packing crate full of jackals and razor wire and rolled down a hill'. He's even up to date with modern horror trends suggesting 'a man with a camcorder glued to his forehead feeding himself into a threshing machine'. So if Twisted Pictures decide to continue the Saw franchise (or hey why not just start remaking them... it's been 7 years since the original! ), then I beg them... contact Mr Charlie Brooker. He'd make a great Jigsaw or just get him to write the script! He did zombies and Big Brother with 'Dead Set'... now he can do murderous serial killers and make a start with bloody Kirstie and Phil. The Swedes have been getting some international recognition recently with 'Let The Right One In' and the 'Millenium' trilogy, the Finnish have brought the world 'Rare Exports: A Christmas Tale' (now with Hollywood voiceover http://www.youtube.com/watch?v=2pH9IyqTk1E) and now the it's the Nords turn to bring out the trolls and hopefully have a monster hit! Another mockumentary where a group of filmmakers go looking for trouble and find more than they expected (see also Blair Witch, Rec and Last Exorcism), this looks fun, funny and maybe... just maybe, a little scary! Cracked camera lenses, night vision, characters talking direct to camera and shaky handheld shots are all present in the trailer and hopefully will give this some sense of realism that the dodgy effects, silly monsters and funny dialogue may detract from. Hope this gets a UK release! Wow! Kids with cameras. Riding bikes. Missing dogs. Missing people. Aliens on the loose? Train crashes, explosions, a small town under attack! This film looks like it may have everything. The soundtrack to the trailer inspires awe and fills me with nostalgia for Spielbergs old movies. The kids, the adults, the time and place all feel so Spielbergian and takes me back to films of the eighties where the kids are resourceful, wide-eyed heroes. With JJ Abrams directing (and continuing a familiar idea of characters with cameras... see also the Abrams produced Cloverfield), and Spielberg producing, I'm hoping for a similar vibe to The Goonies or Back to the Future, films which Spielberg also produced but left the reigns to directors he trusts. Love the sense of mystery that has been created in the trailer- reminds me of the excitement caused by the trailer and viral marketing for Cloverfield all over again! August 19th feels like a long wait! Another found footage/diegetic camera film released in 2010. Beginning with ominous titles that reference the studio that made the film and insisting on its 'authenticity' ('Paramount wishes to thank the families of the deceased and the police department'), Paranormal Activity 2 uses security camera footage and the domestic camcorder to create its demonic scares. 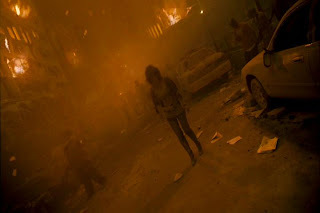 Similar to other found footage movies, the characters in the film often hold the camera, there is no non-diegetic soundtrack and the camera's night vision function comes incredibly handy to the characters at some point in the film. There are jumpcuts to speed things along and as in the first Paranormal Activity, the footage is occasionally speeded up to get to the shock scares. And a couple of these moments should startle even the most hardened horror fans. Micah from the original Paranormal Activity pops up in some scenes to acknowledge the camera and proclaim 'I'm definitely getting one of those' and the end of this sequel is very cleverly wrapped up with the climax of its predecessor. Worth a watch if you like these sort of films but if you don't then this one isn't going to convert you into a fan. Better than the first film? 3. The soundtrack's use of original score and existing songs. 5. How the soundtrack, cinematography and editing complimented each other. 6. Enrique Chediak and Anthony Dod Mantle's cinematography. 7. It's better than Danny Boyle's last film Slumdog Millionaire and that won 8 Oscars. 8. The bravery of Danny Boyle for tackling such a challenging script and for taking on a seemingly unfilmable book set predominantly in one location with an ending most people know already. 9. 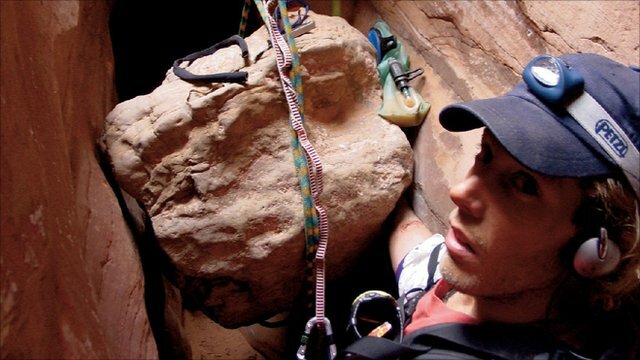 Danny Boyle and Simon Beaufoy's adapted screenplay from Aron Ralston's brilliant book. 10. The King's Speech isn't THAT good is it? 11. If Fincher and Aronofsky keep making Oscar contenders we may never see them reach the dizzying heights of Academy ignored classics like Fight Club and Requiem for a Dream again. 12.7. A guy cuts his freaking arm off in it and it takes him about 20 minutes! (I think this reason is worth an extra 0.7) Made me want to cheer a hell of a lot more than a guy overcoming a stutter to announce a war! Maybe I'm being unfair... Did King's Speech, Social Network, Black Swan, Inception deserve the awards they got? 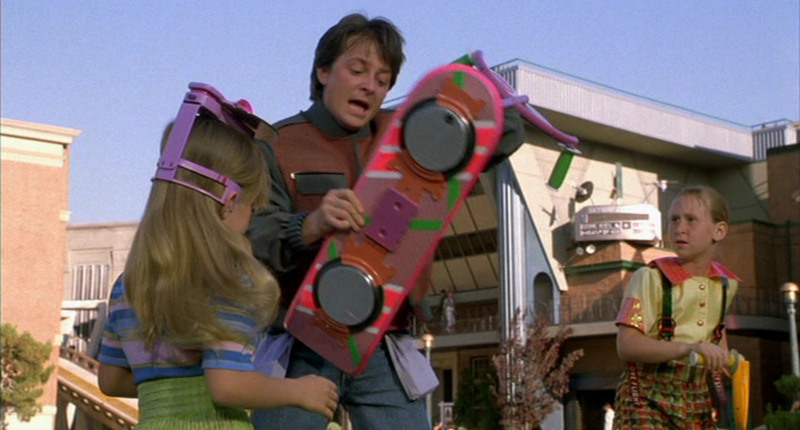 Just finished re-watching the Back to the Future trilogy on DVD. Reminded how absolutely brilliant the first film is. The screenplay is so well crafted and the complications build and build right up to the climax which is still nail-bitingly tense even after watching it so many times. Marty and the Doc have got to be one of the great buddy-pairings of cinema or at least 80s blockbuster cinema when everyone was making 'buddy' movies. And it's a film that sets up a sequel in a totally not annoying way but the rest of the film itself still feels like a complete story (like The Matrix also does). Two was slightly disaappointing after all these years of it being my favourite of the trilogy. Still very clever (with the alternate 1985 and discussion of continuums) and love going back into the first film but this time it just kept reminding me of how perfect its predecessor is. As for part three, it's never been anybodys favourite as far as I'm aware but the train sequence at the end almost equals the clocktower climax of the first film for nail-biting thrills. Just don't mention the lessons learned and flying train ending. The whole trilogy should be celebrated for so many reasons; Michael J. Fox and Christopher Lloyd's awesome performances, Robert Zemeckis pushing the technology of cinema forwards (and not forgetting his great characters), not ruining the childhood memories of so many by cashing in with a far inferior fouth film, Crispin Glover and last but not least Thomas F. Wilson as Biff who is a hysterical panto villain throughout. 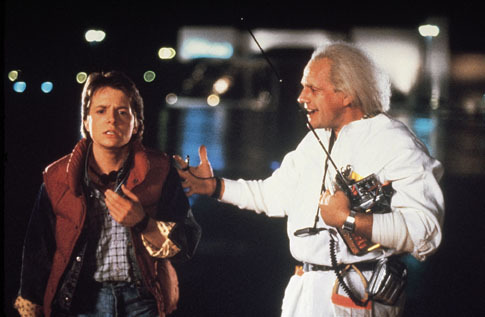 It's also got me wondering: Are these the greatest films featuring time travel ever? Quite sweet really aren't they? New film from director Joe Cornish (from Adam and Joe!). Looks hilarious. Inner city kids get 'tooled up' to take down invading aliens! Includes plenty of urban slang, the downsides to texting, possibly a bit of knife crime and long haired funny man Nick Frost. Let's hope all the best bits aren't just jammed in the 2 minute trailer. Websites up and it's released on May 11th 2011. Looks like great performances from the kids. Cornish calls it a comedy horror and emphasises that he thinks comedy horrors should be scary. Trailer convinces of the comedy, will have to wait and see how the horror side fares. Any thoughts? Why are there so many of these films? What's the appeal? Don't get me wrong, I love many of these films but why this trend now? Here is a link to my first film journal article for international journal Ol3Media. It's completely free to take a look so please enjoy! It's near the bottom and it's called Cloverfield and Zero Day: Shooting America's Scars.